While real estate developers dream of luxury high rises, many Harlemites worry that massive redevelopment of 125th Street could change their neighborhood forever. “If you leave Africa and come to America, when you go back home they say, ‘Have you been to Harlem?’ And if you say no, they say ‘Go back. You haven’t been to the United States,’” said Shange, who has owned the Record Shack on 125th Street across from the Apollo Theater for 36 years. His claim may not hold true much longer. Shange is a member of the Coalition to Save Harlem, which is leading grassroots opposition to the city’s proposal to rezone 125th Street and promote commercial and housing development. Organizers say the plan could turn the center of black culture and business into a canyon of luxury high rises. A vote by the New York City Planning Commission on March 10 could stop the proposal or send it on to City Council. The city estimates the plan will generate 1.8 million square feet of new commercial retail, office and hotel space that will push 71 small businesses out of 125th Street. A related rise in real estate values could dramatically reduce the ability of the remaining small businesses to afford space in central Harlem. “The Record Shack is the only thing left now that is the semblance of black-owned business and a musical outlet. Why should it come down to that?” said Shange, who leases his storefront and is locked in a fight with his landlord, the United House of Prayer for All People, over its refusal to renew his lease. The church owns several buildings in central Harlem, and recently welcomed new tenants — Duane Reade and North Fork bank — onto the block where Record Shack has stocked a broad spectrum of black music for more than three decades. Shange now pays about $54 per square-foot to lease his storefront. Commercial real estate companies lease nearby retail space for as much as $175 per square-foot. The Department of City Planning announced the 125th Street rezoning plan last October as part of Mayor Bloomberg’s goal of creating regional business districts in all five boroughs. The districts tend to be near major transportation hubs — such as the subway stations and Metro North stop along 125th Street — and have already resulted in the rezoning of nearly 6,000 city blocks. It noted building use regulations in Harlem have gone unchanged since 1961. Known informally as the “river to river” plan, the new rules would apply from Second Avenue to Broadway, from 124th Street to 126th Street. In West Harlem the plan intersects with the planned 17.5 acre Columbia University expansion. Developers with large projects in this area would be required to dedicate five percent of their total floor area — about one floor — to arts and entertainment uses such as museums, performance venues and restaurants. Bonus floor area would be granted to developers who provide space for non-profits arts uses. Third-generation Harlem resident, Steven Williams, has developed three buildings along 125th Street — including 55 125th Street where Bill Clinton leases 14 floors of office space. He plans to follow the rezoning rules when he redevelops the historic Victoria Theater with Danforth Development Partners, LLC. The new Victoria Theater will combine with the Apollo Theater to create one site that hosts two theaters and the Harlem Jazz Museum, as well as a hotel and apartments. Williams said he planned to hire local residents for at least a quarter of the jobs created by the project, which he said will allow them to afford to continue living in the area. He leases office space to city and state social service agencies, such as the New York City Housing Authority, Workers Compensation and a Veterans Health Clinic, so that residents can access services without leaving the community. “We’ve been able to do things that have helped improve the quality of life for residents of Harlem in a very demonstrable way,” said Williams. The 125th Rezoning plan has no mandate for affordable housing, but offers developers incentives for providing affordable housing by granting them higher density in return. If developers meet the requirements of city, state and federal housing programs they can also achieve higher levels of affordability on site. Williams said he will probably include affordable apartments at an off site location — about two blocks away — which the city’s inclusionary housing rules allow him to do. The average Harlem resident has a yearly income of $26,000 and it is unclear yet if the apartments will be in their price range. Nellie Hester Bailey, Director of the Harlem Tenants Council has noted the city already identified projected developments that will produce 2,500 units of luxury housing in the business corridor with only 500 of those units classified as affordable. Even affordable units would be out of the price range for the average Harlem resident. “If the only black presence in Harlem is a memory in the form of museums and place names, to hell with that,” said Adams. He said the city ignored his suggestion to include preservation in the rezoning plan and to landmark historic buildings that were important in the Harlem Renaissance and civil rights struggles. After it invited him to a planning meeting once, Adams said he never heard from the city again. He did notice that his name is listed on the Department of City Planning’s website as one the “stakeholders, property owners, residents and elected officials” who held more than 150 meetings to discuss and refine the plan. 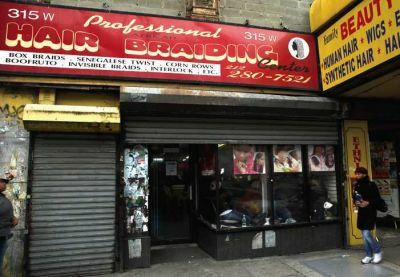 Several Harlem organizations that are dominated by developers, including the 125th Street Business Improvement District, played key roles in shaping the proposal. Reverend H. Swaringer of the United House of Prayer — Shange’s landlord — is on its board of directors, along with seven major property owners. The 125th Street BID is chaired by Eugene Giscombe, whose company brokered a $50 million dollar deal last September for property along 125th Street and reportedly made a 10 percent commission. Now that the official public comment period for the plan is over, the City Planning Commission votes on the proposal March 10 and then City Council has 50 days to approve or reject the commission’s decision. Harlem’s city council representative, Inez Dickens, is real estate developer who backs the proposal. Dickens was elected in 2005 and can stay on the council until 2013. She is the daughter of the late Harlem assemblyman, Lloyd Dickens. 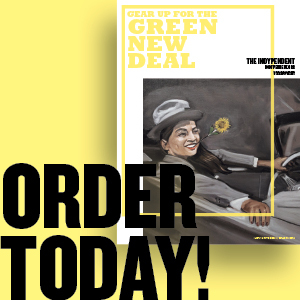 Her future politics prospects could depend heavily on support from key backers of the plan, such as Mayor Michael Bloomberg and Rep. Charles Rangel. Between now and March, grassroots organizers who oppose the plan are trying to galvanize Harlem residents to pressure other council members to vote against the rezoning. A meeting to rally small business owners and those who would be displaced is scheduled for Saturday, Feb. 23 at the Harriet Tubman School (250 W. 127th Street). Sikulu Shange said his efforts to educate fellow small business owners have been challenging. If the movement to defeat the 125th Street Rezoning Plan succeeds organizers say it could save the epicenter of black culture and business from being torn down in the name of progress. If it fails, there will always be the special arts and entertainment district. But Henry Adams says it won’t be the same. Mayor Ed Koch creates the Harlem Task Force to study redevelopment proposals from private developers and community groups. 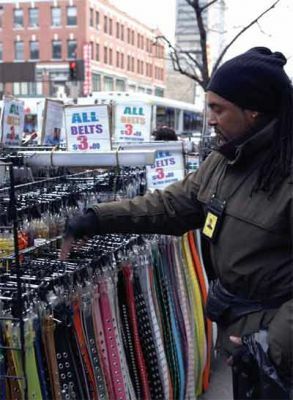 It focuses in part on 125th Street as “a commercial corridor for economic development.” The task force includes members of the City Planning Commission and works with Harlem business executives and bankers, who form the Harlem Business Alliance. 125th St. Business Improvement District (BID) is established. It includes several developers and plays a major role in shaping the 125th St. Rezoning Plan. The BID later recommends the 125th St. Rezoning Plan to grant floor space bonuses to developers who provide space at below market rate for cultural, arts and entertainment uses. Congressman Charles Rangel (D-NY) authors the Federal Empowerment Zone legislation meant to create jobs and business opportunities in nine urban neighborhoods, including Harlem, which receives $300 million for loans and grants over a ten year period. The Upper Manhattan Empowerment Zone (UMEZ) makes a $11.3 million dollar loan to finance construction of the Harlem USA shopping mall at 125th Street and Frederick Douglass Boulevard, which includes an Old Navy, Chuck E. Cheese and K&G Fashion Superstore. Critics refer to UMEZ funds as Rep. Rangel’s “slush fund” and say it fails to support local business growth because less than 40 percent of retail businesses in the area are minority owned. The UMEZ is extended through 2009. The UMEZ CEO and president is Kenneth Knuckles, who is appointed Vice Chairman of the NYC Planning Commission by Mayor Bloomberg. The Department of City Planning initiates the 125th Street Study in 2003 “in response to anticipated development activity in Harlem,” and partners with several organizations on an Interagency Team to create a development framework. An advisory committee holds more than 150 meetings to consult elected officials and community members on zoning, transportation, housing and the arts. None of the official meetings center on housing. Specific recommendations for labor rights, wage agreements and preservation of landmark buildings are not included. The City Planning Commission’s preliminary assessment determines that the displacement of 71 small businesses would not cause a significant adverse economic impact. 125th Street BID Chairman Eugene Giscombe Henderson brokers the record-breaking $50 million sale of a key block of Harlem property on Frederick Douglas Boulevard to Kimco Realty Corporation and the Sigfeld Group. Harlem’s 125th Street, long home to black-owned businesses and cultural institutions, is the centerpiece of a city rezoning plan.